PBC USA, a global real estate investment firm headquartered in New York City, has appointed powerhouse real estate brokers John Tippins of NorthCap and Jeff Mitchell of Mountain West Commercial to head up the retail leasing at Tivoli Village. Tivoli Village is a mixed-use center that includes 742,000 square feet of retail, beauty, service, restaurant and Class A office space within a 28-acre development. Anchor tenant Restoration Hardware’s flagship store is joined by boutique retailers, local and national office tenants and nearly a dozen popular restaurants and a cigar bar in the center’s open-air environment. Hirschi Masonry, a masonry contractor based in Southern Nevada, has announced the completion of work at Firetrucks Unlimited at 1178 Center Point Drive in Henderson. Tivoli Village opened Phase I in 2011 and Phase II in 2016 on 28 acres northwest of the Las Vegas Strip. Developers are in talks to create luxury condominiums at the complex. “We look forward to providing the community with an even greater selection of unparalleled experiential retailers,” said Tippins, CEO of NorthCap, a leading real estate company focused on acquisition, brokerage and property management with a long history of working with local tenants. In addition to the new retail leasing team, the ownership also recently tapped Philip Knott as general manager of Tivoli Village. Prior to joining Tivoli Village, Knott served as vice president of operations for International Market Centers, where he oversaw the daily operations for the firm’s 12 million square feet of exhibit space in Las Vegas, NV and High Point, North Carolina. 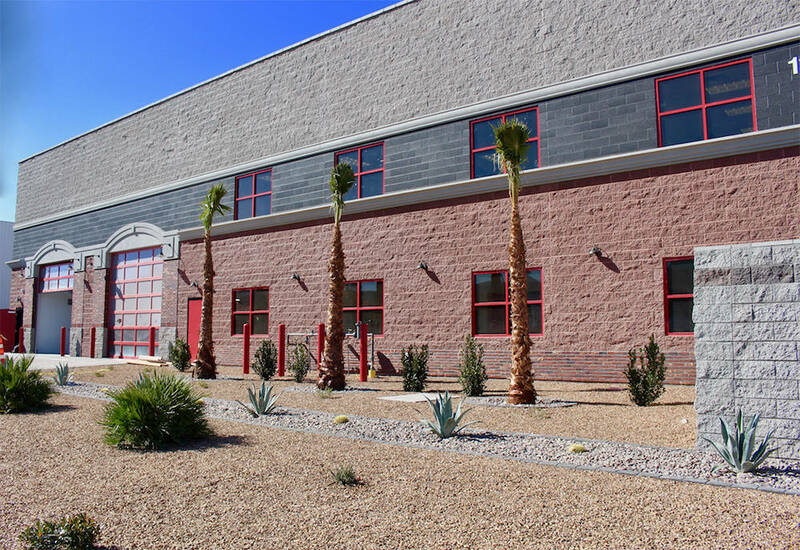 Hirschi Masonry, a masonry contractor based in Southern Nevada, has announced the completion of work at Firetrucks Unlimited at 1178 Center Point Drive in Henderson. Firetrucks Unlimited provides fire truck refurbishment services to municipal, government and military clients. The new building serves as housing for a vintage fire truck collection. “This project is one of the most remarkable designs that utilizes different colors. We are proud to be a part of creating an aesthetically pleasing building,” said Chad Hirschi, president and CEO of Hirschi Masonry. Hirschi began its work on Firetrucks Unlimited in August 2017 and is scheduled for completion in February 2018. Hirschi installed site retaining and screen walls to resemble a classic fire station. The structure utilized four different concrete masonry unit , or CMU, colors and two different exterior textures, as well as brick veneer. The total CMU count for thestructural building was approximately 23,700 units, which was installed in four weeks’ time. More than 8,500 units of brick veneer were implemented to complement the structural CMU walls. The brick veneer added a sense of character to the building and was created using both running bond and soldier-course patterns. Leading Realtors from throughout Nevada will be showing off real estate and investment opportunities in the Silver State by attending MIPIM, the world’s leading global real estate market, business conference and networking event, being held March 13-16 in Cannes, France. Nine Nevada real estate leaders are attending the event, representing the Nevada Realtors, the Greater Las Vegas Association of Realtors, the Reno-Sparks Association of Realtors and the Commercial Alliance Las Vegas. They include Nevada Realtors CEO Teresa McKee; GLVAR CEO Wendy DiVecchio; 2017 Nevada Realtors President Greg Martin; 2017 GLVAR President David J. Tina; 2017 CALV President Jennifer Ott, CCIM; 2018 RSAR President Doug McIntyre; Diane Brown, of the Northern Nevada Realtors, who has chaired the state association’s Global Committee; and Rena Levy and Tamara Larisa Tyrbouslu, Las Vegas Realtors and longtime leaders of the Global Committees for both GLVAR and Nevada Realtors. These Nevadans will be part of a growing USA pavilion, hosted by the National Association of Realtors, the nation’s largest real estate trade organization. NAR will be among 3,100 exhibitors at this year’s event. This will be the third year Nevada Realtors have attended MIPIM, said Heidi Kasama, 2018 president of the Nevada Realtors. This year, she said Nevada’s representatives will bring more information about the most significant real estate and development projects being built or planned in the state. She said examples range from Tesla’s gigafactory being built near Reno and Sparks to the $1.9 billion stadium being built near the south end of the Las Vegas Strip, to billions of dollars in other, less well-known but still significant developments. Kasama pointed out that prices for Class A properties in many large U.S. markets have surpassed pre-recession levels, while many mid-sized and smaller-tier markets like Reno and Las Vegas “still have room for prices to appreciate” and could benefit from increased interest from foreign commercial property investors. In addition to Nevada, markets featured in the USA pavilion include the states of Arizona, Illinois, Missouri, North Carolina, Rhode Island, Virginia and Washington, and the metro areas of Beverly Hills/Greater Los Angeles, Coastal Carolina/Myrtle Beach, Northern Virginia and San Antonio. Markets participating in the USA “zone,” adjacent to the USA Pavilion are Florida State, Miami and San Diego, along with the CCIM Institute and the Society of Office and Industrial Realtors.